If you are injured at a job, or if you want to buy or sell property, you will likely need an experienced attorney's help. Both real estate laws and workers' compensation laws are complex and contain many pitfalls for a layperson. The workers' compensation and real estate lawyers at Pulgini & Norton can offer people in Norwood the knowledgeable advice and representation that they need. If you are injured at your job, you may be able to recover workers' compensation benefits. These benefits are rewarded irrespective of fault. If your accident occurs at the workplace and involves a straightforward diagnosis, such as a broken bone, you may be able to recover benefits by simply notifying the insurer. However, cases involving more unusual illnesses or injuries, or an aggravation of preexisting conditions, may involve a lengthy claims process and appeals. In some cases, for example, a worker is hurt in a car accident on the way to a job at a fixed office or when leaving that job. In that case, under the coming and going rule, the worker cannot recover benefits. However, if an employee is injured while traveling for his job, he may be able to receive benefits. Benefits may be available based on two factors: when he was being paid at the time of the accident and when he was being reimbursed for the cost of travel. Some of the benefits for which you may be eligible include partial incapacity, permanent and total incapacity, temporary and total incapacity, medical benefits, rehabilitation benefits, and disfigurement or scarring benefits. An employer may have designated a provider within its plan for a first visit to the doctor. After that, however, you can see a doctor of your choice for treatment, as long as the doctor accepts workers' compensation insurance. For many first-time homebuyers, a condominium unit is their first home. Condominiums are a form of ownership governed by Massachusetts General Laws (MGL), Chapter 183A. The condominium is established by filing a master deed, unit deeds, a declaration of trust, and bylaws. It is important to review these documents carefully with an attorney if you are planning to buy a condominium unit so that you understand your rights and obligations. Among other things, you should look for restrictions on how you use the unit and how disputes will be determined. In the individual unit deed, there may be restrictions about noise, pets, and renting the unit to others. The individual unit deed will also describe what you own, your percentage interest in common areas, and whether your unit includes any limited common areas, such as a yard. It is crucial to understand the dispute resolution process in the master deed. While condominiums can be affordable, disputes may arise while living in an arrangement involving common areas, and you should know how these would be resolved before committing to a unit. 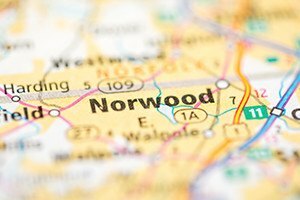 The Norfolk County town of Norwood was named after an English town. With about 29,000 residents, it is located on the Neponset River. At Pulgini & Norton, we are experienced real estate and worker’s compensation attorneys who can help Norwood residents protect their interests. Call us at 781-843-2200 or contact us via our online form for a free consultation.